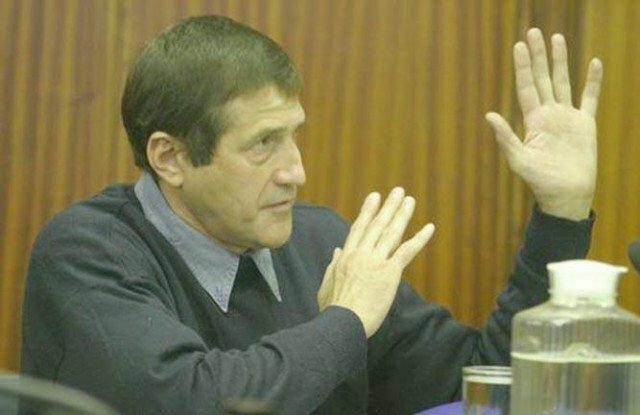 South African apartheid assassin Eugene de Kock has been granted parole after 20 years in jail. The death squad commander was nicknamed “Prime Evil” for his role in the killing and maiming of activists fighting white minority rule in the 1980s and early 1990s. Justice Minister Michael Masutha said Eugene de Kock would be released “in the interests of nation-building”. Eugene de Kock, now 66, was sentenced in 1996 to two life terms in prison and a further 212 years for the crimes he committed. Michael Masutha said the time and place of Eugene de Kock’s release would not be made public. The justice minister stressed that his decision was guided by South Africa’s constitution. Sandra Mama, widow of Glenack Mama who was killed by Eugene de Kock in 1992, said she thought the minister was right in granting parole. The former colonel was head of the notorious Vlakplaas police unit. He appeared before the Truth and Reconciliation Commission (TRC) which was established a year after South Africa’s first democratic elections in 1994. Eugene de Kock confessed to more than 100 acts of murder, torture and fraud, taking full responsibility for the activities of his undercover unit. He was granted amnesty for most offences but the TRC only had the power to grant amnesty to human rights violators whose crimes were linked to a political motive and who made a full confession. During the TRC hearings, he described the murders of a number of African National Congress (ANC) members, in countries including Lesotho, Swaziland, Zimbabwe and Angola, naming the police commander above him in each case. Whilst in prison Eugene de Kock did a radio interview in 2007, accusing South Africa’s last white ruler FW de Klerk of having hands “soaked in blood” for ordering specific killings. The former president denied the allegations, saying his conscience was clear. Eugene de Kock also made contact with some of his victims’ families while in jail, asking for forgiveness.